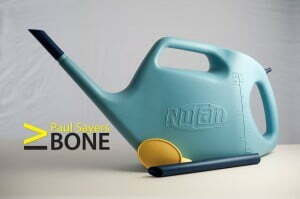 The NuCan Push Button Watering Can is a revolution in watering and a boon for gardeners everywhere. It’s unique push button puts you in control…no more spills, over watering, puddles or dripping. The accuracy and control provided by the 7 litre NuCan saves water, saves time and if your water is metered, even saves you money. The miracle watering can is equivalent to walking around your own garden or home with a kitchen tap in your hand. The miracle watering can is a tool, you have complete control to turn it on or off when you want. Let the button take the strain. The NuCan’s patented design revolves around a unique push button system that gives you total control over watering. No more tired, sore wrists and arms when you let the button do all the hard work. 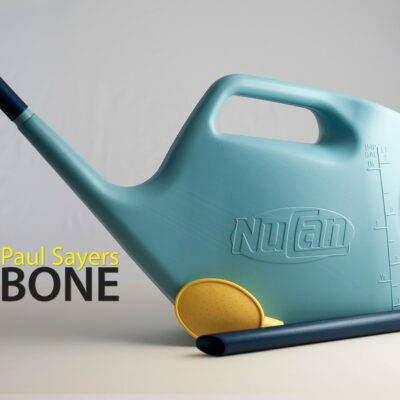 Simply hold the 7 litre miracle watering can at an angle and level that is comfortable for you and use Nucan’s unique button to control the flow of water. You can even keep the Nucan pointing straight down in a natural position. The constant, tiring tipping back and forth is a thing of the past. NuCan is ideal for spot weeding. With the fine rose attachment which is supplied with the can, this enables you to water seedlings without fear of damaging them. However, once you’re accustomed to using your 7 litre NuCan with its incredible control, you’ll discover that the rose attachment is not needed as much. The NuCan combined with the short spout allows you to deliver water at exactly the right place and exactly the right flow rate for the job. The image to the right demonstrates just how accurate you can be when watering outdoor seed rows, which allows the gardener to place the water just where it’s needed to the root system. TOP TIP – Imagine this kind of accuracy whilst spot weeding paths and driveways, even in the center of the lawn. You’ll save valuable weedkiller and kill the weeds more effectively which is very good for our environment. 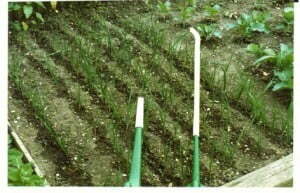 To water seedlings in trays, place the end of the spout attachment on the edge of the tray, then release the water which will skim along the surface of the soil (this is called skimming). The miracle watering can comes complete with rose attachment, short spout and a medium spout (25cm). Also available separately is a half metre spout for every eventuality, which is extremely beneficial when leaning into rockeries, over seedlings, out to window boxes and when watering hanging baskets, click here to be taken to the half a metre spout attachment. The miracle watering can helps you in so many ways right through the gardening seasons. Click here to view the PinPoint indoor watering can, which will help you look after all your house plants, and your cut flower’s with confidence. The NuCan holds 7 litres and is available in our stylish blue.